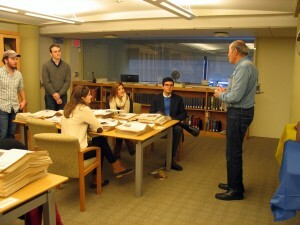 Ben Barber ’65 held forth to the students about the importance of editing, especially when the current editor revealed that many student contributors were offended by changes made to their copy. “That’s journalism,” said Barber, a professional journalist for decades who currently writes for the Huffington Post, and who made it clear that every writer needs an editor. Barber left Trinity and “became a hippie,” as he says, roving through India and Thailand for ten years, writing poetry and selling stories to newspapers back in the US. He spoke at length with several students about writing and reporting. 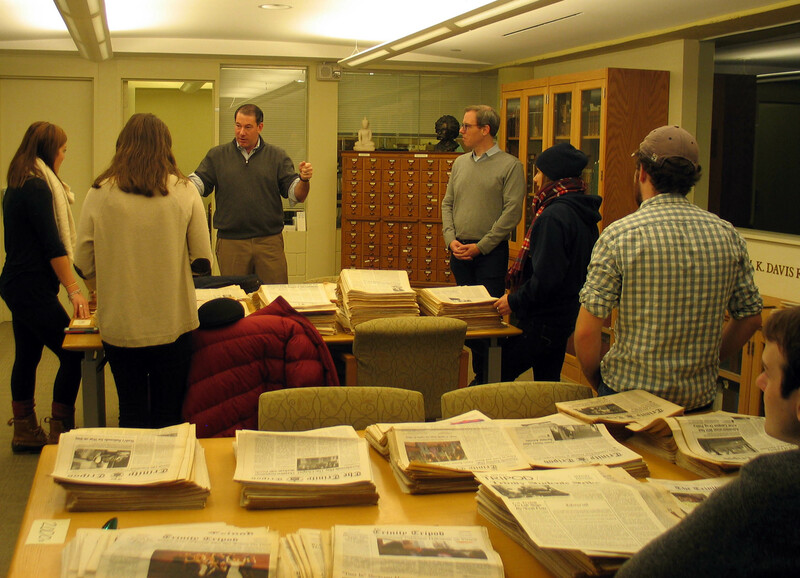 Robert Cockburn ’90, who also serves on the Board of Fellows, talked animatedly with the students and other alumni (Pat Sclafani ’83, and Patty Hooper Kelley ’82) and told stories of their days with the paper. A bit later Marybeth (Callan) Serdechny ’83 and Que (Ho) Witik ’83 dropped in and reminisced about the classmates they saw in the stacks of Tripods from the 1980s. Another alumnus, Dan Kelman ’76, who served on the Tripod as a freelance photographer in the early 1970s, pointed out many of his pics and reminisced about his friend Dave Levin ’75, who went on to shoot photos for Sports Illustrated. 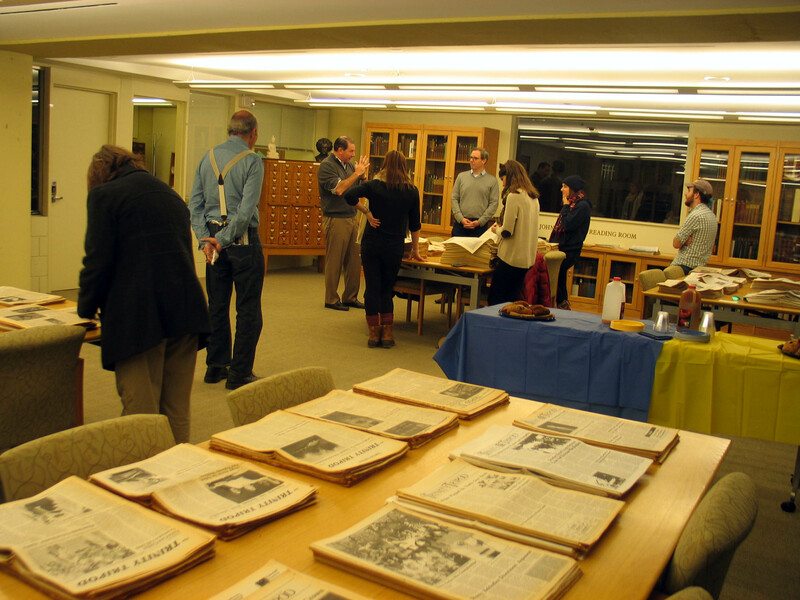 It is a fitting day to announce the recent gift of a small but fascinating archive from Jon Reynolds ’59 (Hon. D.H.L. ’15), a decorated veteran and an honored son of Trinity College. 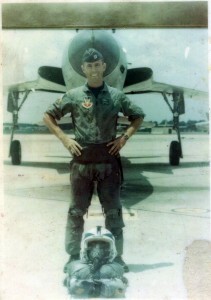 Mr. Reynolds is shown here in front of his fighter jet in the early 1960s, and in May when he received his Hon. D.H.L. from Trinity. Commissioned via the USAF ROTC program after he graduated in 1959, Mr. Reynolds was a seasoned fighter pilot when he was deployed to Vietnam in 1963; he was shot down on November 28, 1965 while flying an F-105 fighter-bomber, was captured and survived as a POW for seven years. After his repatriation in 1973 he had a distinguished career in the military and later with the Raytheon Company. The archive we have received can be broken down into three parts: official and non-official correspondence related to his capture and imprisonment (including a dozen or so letters he sent to his parents during his captivity), as well as news clippings and published materials; letters he received after repatriation as a result of the VIVA campaign (see below); and printed epehemera and a small amount of official materials related to his post as air and defense attache at the U.S. Embassy in Beijing, China from 1984-1988. One of the most interesting aspects of this archive are the hundreds of letters Reynolds received as a result of the VIVA campaign–from total strangers, even from elementary schoolchildren, expressing support and good wishes, and shared stories. Initially an acronym for Victory in Vietnam Association, VIVA was incorporated in 1967 by a conservative student group who preferred the lectern and the party caucus to the picket line. 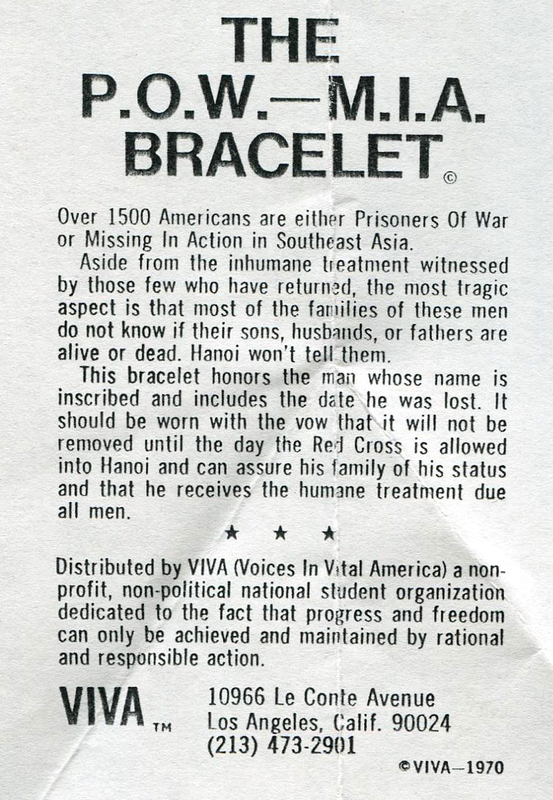 In 1969 the name was changed to Voices in Vital America, to reposition VIVA’s aims to support the war’s troops and prisoners. The bracelet was the goose that laid the golden egg. 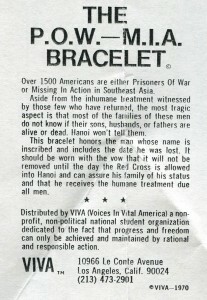 In 1972 VIVA took in $3.7 million, much of which was spent on a massive POW/MIA public awareness campaign that included newspaper ads and billboards, tens of millions of buttons, brochures, bumper stickers, and matchbooks, as well as newsletters sent to a mailing list of over 150,000 (there are examples of many of these ephemeral items in the collection). The collection will soon be processed for research, and is a welcome addition to our archives! Gutenberg Bible comes to Trinity! Well, in actuality, what I just brought back from Oak Knoll Books in New Castle, DE is a fabulous facsimile of the first book printed with moveable type, ca. 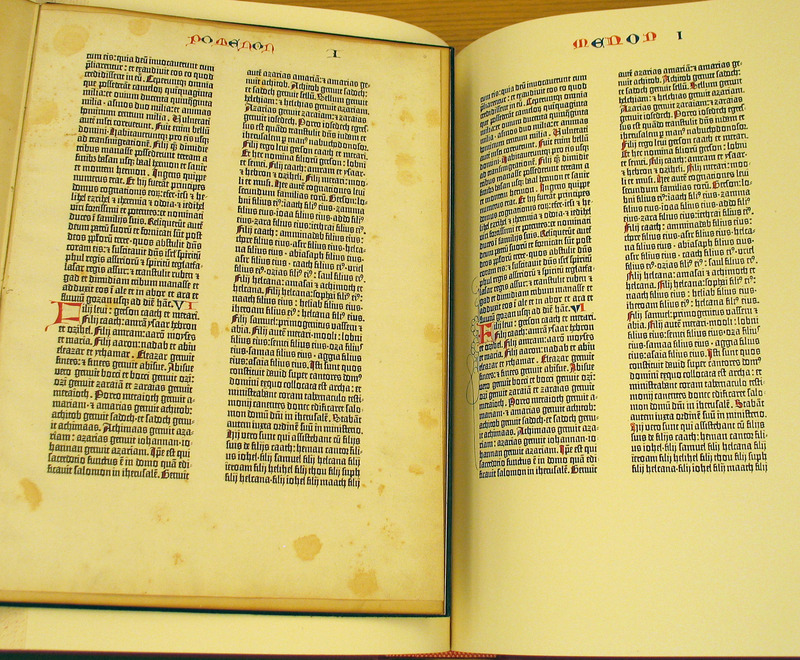 1455, shown here with TWO ORIGINAL LEAVES from a Gutenberg Bible that we have had at Trinity since the Fall of 1950. 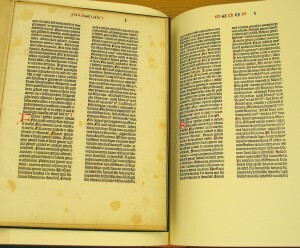 This complete facsimile of the Gutenberg Bible was printed in 1961 by Pageant Books (New York). The reproduction derives from the Insel Verlag edition, which was based on the copy in the Königslichen Bibliothek in Berlin and the copy in the Standischen Landesbibliothek in Fulda, considered to be the most beautifully illuminated of the extant copies. 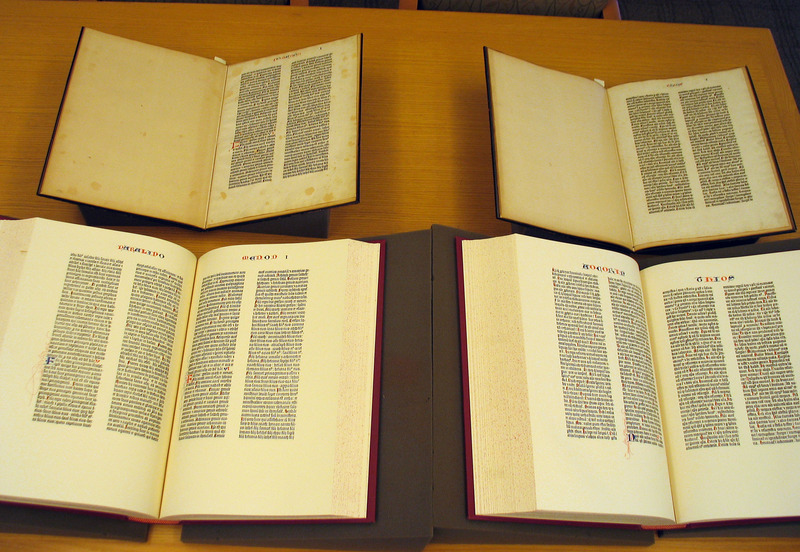 According to the Gutenberg Museum, there are now 49 documented partial or complete copies of the Gutenberg Bible. The two leaves shown here derive from an incomplete copy that was acquired by the New York bookseller Gabriel Wells in a Sotheby’s sale in November of 1920. 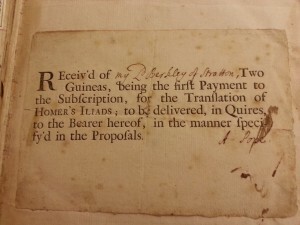 Wells decided to “break” his copy and sell it for the most part as individual leaves, accompanied by an essay by Philadelphia collector, A. Edward Newton, entitled “A Noble Fragment.” Our two leaves are from I Chronicles and I Corinthians. 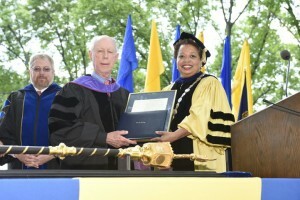 Both were given to Trinity in the Fall of 1950 by the Reverend Joseph Groves (Class of 1910), “from the Ogilby sons in memory of their father, Dr. R. B. Ogilby.” Ogilby was the 14th president of Trinity College (1920-1943). Here is one of the original leaves beside its facsimile counterpart. The acquisition of this facsimile will allow students and faculty to put our “noble fragments” in context, and to make any number of comparisons with later Latin Bibles in the collection, etc., etc. Comments Off on Gutenberg Bible comes to Trinity! Last week in preparing a presentation for prof. Barbara Benedict’s ENGL 364 class, one of the books I pulled was our copy of the first edition of Alexander Pope’s translation of the Iliad (London, 1715-20). Pasted onto one of the flyleaves was a bit of paper that made me (and prof. Benedict, when I showed it to her an hour later) gasp in disbelief and delight. 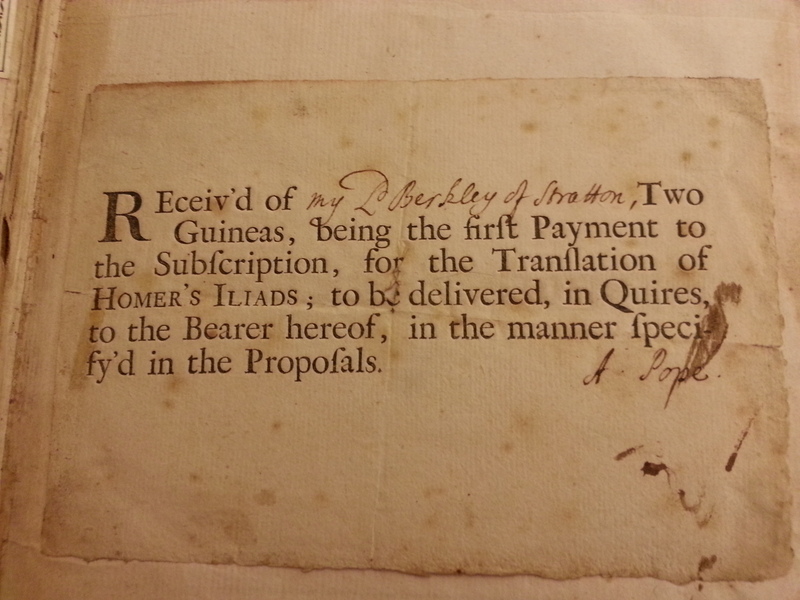 Here we have what MUST be a rare survival–a subscription ticket in Pope’s own hand, signed, for receipt of partial payment by one of his subscribers (and Pope scholars will understand the significance of this particular subscriber as well). It was a great discovery of physical evidence, and allowed us to talk even more fully than we could have (using only the published subscriber’s list) about the ways in which Pope marketed, sold, and distributed the book. You are currently browsing the The Bibliophile's Lair blog archives for November, 2015.